More than just roads, more than just Alpine Climbs, more than just riding. Having visited France once before and traversed many of the quiet and wonderful roads in parts of Burgundy, Provence and the French Mediterranean regions, I approached the Velo Trans Atlantique tour d’Autun-Morvan with some knowledge of the roads of France. Having climbed the fabled Alpe De Huez once and the Giant of Provence, Le Mount Ventoux twice, I was confident that what appeared on topographic maps of Autun to be challenging climbs were well within the abilities of Sabrina and I on a tandem. We were ready for the challenge of riding; we were filled with the anticipation of quiet roads. What we were unaware of and delighted by, lay beyond the roads and resided beyond the mountain tops. What we were treated to and enchanted by was the essence of France, the people, the language, the customs, the wine, the cheese, the bread and the history. Marc’s tour description (see description here) proved to be everything promised and more. The more was the warmth of the journey, warmth that was felt well before we arrived in Paris. Our journey began from the moment we found Velo Trans Atlantique via a link from the Co-Motion Tandem touring website. An e-mail to Marc introduced us to a refreshing series of communications and updates from Marc, providing preliminary information, itinerary, maps, and personal introductions with updates and answers to our numerous questions provided with promptness beyond expectations. Our accommodations in the heart of Paris were more then expected and all that we hoped. A perfect location for visits to all of the must see attractions Paris has to offer. After a couple of days to recover from jet lag and discover Paris we were off to the next stage of our journey and the 19th stage of the Tour de France, the penultimate individual time trial. The spectacle of the Tour de France was all that we had expected it to be, but what was spectacular about our viewing of the Tour was the venue. Marc had arranged for us to view the time trial from the front yard of a working class family in the host city of Le Creusot. The excitement of the day was matched by the warmth of our hosts, introductions to husbands, wives, uncles, aunts, cousins, nephews, friends and neighbors. The sharing of food and drink, the sharing of excitement and cheers as the riders came flying past. Marc provided some help in the area of translations and then stepped back and allowed us to interact and test our French while our hosts tested their English. We were able to take many valued pictures of the racers as they streaked past, but the most valued pictures of that day are the ones taken among our host family, smiles, hugs, and genuine warmth. This was the beginning of what would prove to be a wondrous immersion into French country life. Marc was assisted by two very personable and knowledgeable ride leaders (Pierre and Richard) who combined a love for their community, knowledge of the history of the region and a joy for cycling with a genuine interest in sharing this spirit with us. Marc and his team not only revealed to us the France they already knew, but also had the sense of adventure to seek out and discover with us little bits of France they hadn’t known. An example of this was our visit to a local vignoble Gerard Herve. Expecting the standard wine tasting experience we ended up walking through the vineyard with Mssr. Herve discussing his views on French wine along the way meeting his aged father who still helped him manage the vineyards. This was followed by lunch prepared by Mssr. Herve in his lovely farm home. We were treated to a traditional meal, green salad, roasted chicken and potatoes with vegetables, cheese and bread, all accompanied by his selection of wines. This finished by the sweetest of melons for desert and a sample of wine which came directly from a barrel in his cellar. Wine tasting will never be the same for any of us. Each day provided a new experience in riding, an understanding of French culture, an enjoyment of French cuisine, an appreciation of local history and an opportunity to interact with the local French people. The venues were as varied as the people, as remarkable as the food, as awe inspiring as the history of the area. We visited small wine makers, dined at village brasseries and a regional 3 star restaurant, visited Roman ruins, sat in centuries old churches all while being challenged by rides through beautiful country roads. Sabrina and I have been truly amazed by all that France is, all that Autun and the surrounding countryside have to offer and most especially by how Marc and his staff were able to provide us with the adventure of a lifetime. 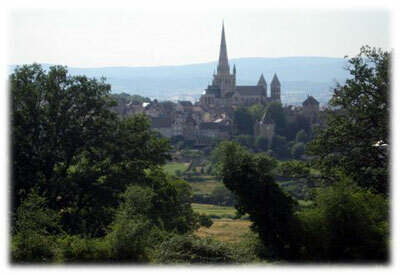 Above is a picture of Autun with the Cathedrale Saint Lazare towering over the village; we attended an outstanding presentation of Mozart’s Requiem inside this amazing Cathedrale.